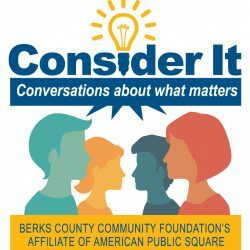 READING, PA – The next installment of Berks County Community Foundation’s “Consider It” discussion series will focus on school choice at a gathering in Reading on September 19. School choice has been a hot topic in Berks County, in part due to a lengthy and costly dispute between the Reading School District and I-LEAD Charter School. The topic has also been in the national spotlight as President Trump and U.S. Secretary of Education Betsy DeVos have focused on expanding education choice. With this in mind, a committee of community members has chosen school choice as the topic for the next installment of “Consider It.” State Sen. Judy Schwank and Berks County Commissioners Chairman Christian Leinbach are co-chairs of this nonpartisan program, which is designed to promote thoughtful discussion of divisive local and national issues while maintaining a level of civility among participants. The next event will take place Tuesday, September 19, 2017, at 5 p.m. at the DoubleTree by Hilton Reading, 701 Penn St., Reading, Pa.
For $10, each ticket includes dinner, the panel discussion, reading material, and an opportunity to participate in the conversation. Carol Corbett Burris: Executive Director of the Network for Public Education, which states that it is “an advocacy group whose mission is to preserve, promote, improve and strengthen public schools for both current and future generations of students.” A former high school principal, she was recognized in 2010 by The School Administrators Association of New York State as the Outstanding Educator of the Year, and in 2013 she was recognized by the National Association of Secondary School Principals as the New York State High School Principal of the Year. She has authored three books on educational equity.Alyson Miles: Deputy Director of Government Affairs for the American Federation for Children, which states that it seeks “to improve our nation’s K-12 education by advancing systemic and sustainable public policy that empowers parents, particularly those in low-income families, to choose the education they determine is best for their children.” She earned her law degree from Capital University Law School and was admitted to the Ohio bar in 2012.James Paul: Senior Policy Analyst at the Commonwealth Foundation, a Harrisburg organization that “transforms free-market ideas into public policy.” His primary research area is education policy. He testified before the commonwealth’s Basic Education Funding Commission, and frequently writes about education spending and school choice. His commentary has appeared in The Philadelphia Inquirer, Pittsburgh Tribune-Review, and National Review Online, among other outlets.Dr. Julian Vasquez Heilig: Professor of Educational Leadership and Policy Studies and the Director of the Doctorate in Educational Leadership at California State University Sacramento. His current research includes quantitatively and qualitatively examining how high-stakes testing and accountability-based reforms and market reforms impact urban minority students. His research interests also include issues of access, diversity, and equity in higher education.Karin Mallett: The WFMZ TV anchor and reporter returns as the moderator for the fourth installment in the series. Three previous “Consider It” events tackled marijuana legalization in Pennsylvania, immigration reform, and the greater Reading area’s economy and revitalization. The sold-out events were perceived favorably by attendees, with 83 to 93 percent stating that differing sides of the issue were represented adequately and 86 to 92 percent stating they had gained insight into the issue. “Consider It” is based on the American Public Square in Kansas City. To adapt the initiative for use in Berks County, the Community Foundation worked closely with Allan Katz, founder of American Public Square and former U.S. Ambassador to Portugal. For the discussion format, “Consider It” uses concepts pioneered by American Public Square. For instance, Schwank and Leinbach ring a “civility bell” if the discussion becomes negative or overly partisan. In addition, applause is forbidden. If the audience begins clapping, the co-chairs ring the bell so that all viewpoints can be heard without seeming to favor one over another. Questions will be collected from the audience and passed on to the panel. “Consider It” is supported by a committee of community residents who have differing political views and backgrounds. Committee members are Steve Elmarzouky, Bill Gage, Mary Kargbo, Joan London, Karen Miller, Art Grim, Kevin Murphy, Michael Rivera, and Marilu Rodriguez-Bauer.